I always forget how great Spitalfields market and Brick Lane are - or maybe not forget, just leave it too long between visits. Well, I went for a browse with my sister on Sunday, and even though the weather was a bit grey had such a nice and inspiring time wandering around the stalls and shops. It's incredible how much - and how quickly - the area has changed in the last few years. Some of it feels a bit shiny and new, but its still charming. We went to Cheshire Street, just off Brick Lane, a little street that I'd come across a couple of years ago accidentally and really liked, but never been back. It turned out to be the best thing of the day. 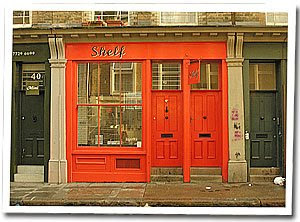 Such lovely shops, all small and painted different stylish colours. Half of them were closed, but this one, Shelf, was an absolute joy, with just a very select range of homeware - bowls, russian dolls, prints, enamel letters, books, bags etc. etc.. They had Camilla Engman prints and Rob Ryan tiles. So many gorgeous - but understated - things we were a bit blown away!